Are you having trouble remembering things? The inability to recall information when we need it is not only frustrating it can be embarrassing as well. We are all bombarded with information every second of the day, to the point where it even becomes an information overload. Despite this, our ability to focus and remember things is critical to our success. So, would an enhanced memory improve your life? Almost everyone regardless of age or occupation will benefit from having an excellent memory. This Hypnosis MP3 will help you: ~Tap a fantastic source of information ~Find it easy and natural to remember ~Become more confident ~Drastically improve your memory ~Be calm and relaxed when trying to recall information. All your memories are stored in your subconscious mind. Anything you have ever seen heard or experienced is stored in your subconscious mind. 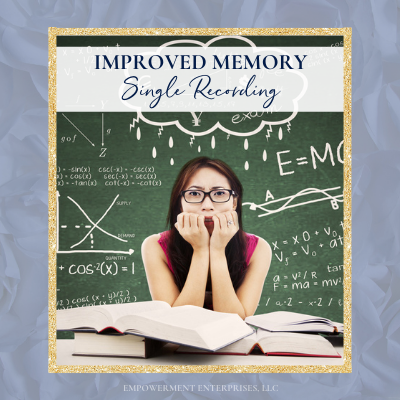 Catalyst Hypnosis Center’s Improved Memory Hypnosis MP3 enables you to tap into your subconscious mind and teaches you how to easily and effortlessly access those memories whenever you need to, helping you recall whatever information you need easier than ever before. Isn’t it time you unlocked your brain power and improved your memory?